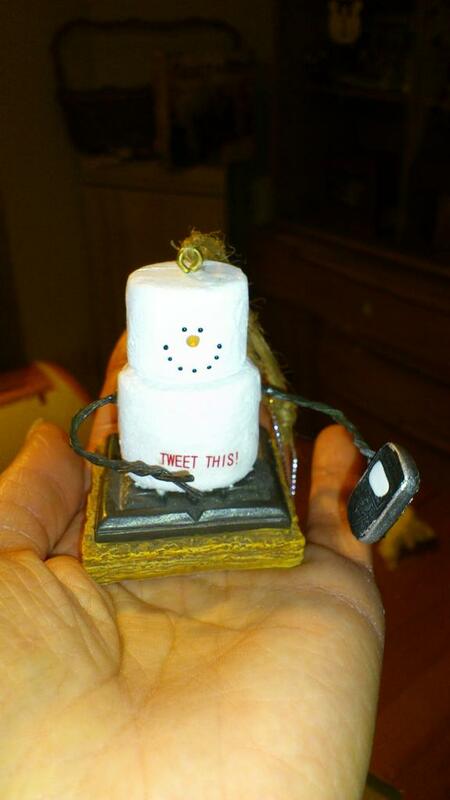 This December I participated in For The Love of Writings' Bloggy Ornament Exchange. I love exchanges, usually I do craft associated ones because I love making stuff and I love learning new techniques from other people. However this year I was not feeling the Christmas mood and needed some inspiration to get my Christmas tree put up. Not having the kids for Christmas Eve made me kind of wonder what the point was know what I mean? The idea of an ornament sent from somewhere else was just the spark I needed to get myself into the Christmas spirit. After all it would need a home right? Cat had a blast picking out the ornaments (she felt they were friends and needed to stay together) to go out to my recipient and we got it shipped out on Sunday no problem. I hope they made it to their new home in a timely fashion. Isn't he adorable? It's hard to make out in the picture but his stomach says "Tweet This!" He has now made his home happily near the top of my tree. Melissa, I have found that whenever I use my Galaxy tablet to tweet, I invariably make grammatical errors. Do you find that to be true as well? I'm so glad you got it!!! I did and I love it! It is so cute.